Adventure Performance Training designs performance training programs for adventure athletes to achieve optimal performance in the backcountry. We understand the unique needs of endurance athletes who train and perform in the mountains. All programs follow an integrated, systematic approach. This allows us to progress any athlete to any performance goal while minimizing the chance of injury. 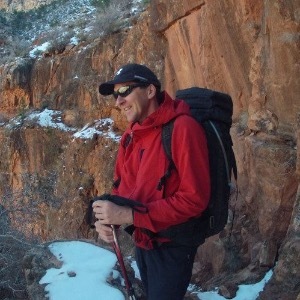 James Fisher is a NASM-Certified Personal Trainer, Performance Enhancement Specialist and Corrective Exercise Specialist based out of Sedona, Arizona. Since 1995, James has helped endurance athletes, mountaineers and backpackers establish a strong foundation of fitness and improve performance in the backcountry. The Integrated Performance Training Program helps athletes of all levels to correct muscle imbalances, improve flexibility, develop strength and improve performance. When not developing programs, James can be found on the trails, rock climbing, canyoneering and exploring the Grand Canyon. Success. Coach James Fisher has been notified of your message.